Often, we write these blog post to brag about our amazing accomplishments, but sometimes, just sometimes, game programming can be just that: …programming. This week there are no heroic successes, no courageous stories, no valiant efforts or exaggerated achievements. No this week it was just work. So what does a ‘normal’ Friday of working on Caromble! looks like? Well, we’re rewriting how we save our assets in the build script, fixing issues that are causing micro stutters in the menu and explosions, improving gameplay for levels in the last chapter, working on the new paddle and alien models (yay! ), building the menu, fixing and adding sounds, celebrating Sinterklaas, buying a new bicycle etc, etc. I guess nobody can accuse us of being lazy on Fridays. But as you can see, we need more Fridays in a week! So what to do with lack of content. How do we get away with this? Screenshot! …and back to work; who needs sleep anyways? What all game developers probably recognize, is that you can think of too many cool features for your game. When we were in the beginning (read: ‘more than a year later’) of the development of Caromble!, we realized that we had too many features planned for the game. Almost every new level would introduce a new gameplay feature. Finally we became smart enough and decided to choose a list of features to implement and just leave the rest be (I miss you so, oh ‘gravity switch’ and ‘teleporter’). This turned out to be a good decision (still I’ll never forget you…). There is so much more we can still do with our current set of features, that I believe we could make a hundred more levels with these, without becoming repetitive. It is a pity though, that some of the cool features we ‘invented’ are not in the game. But thank goodness we have some unlockable challenge levels! Caromble! features 24 story driven levels, these are at the heart of what Caromble! is. When certain targets are met in the story, a challenge level is unlocked. A challenge level is a small simple area, in which the player gets one specific task. These levels can be crazy strange and each one stands on itself. No rules, just fun! This allows us to introduce a new feature only for that level. And why not, everything is possible in the HAVEFUN (Hypnotically Abstract Virtual Environment For Unconventional Needs (name suggestion pending)); the simulation room in the mothership designed for training purposes (story pending). The tasks in the challenge levels range from: ‘hit as many blocks in 1 minute’ to ‘survive as long as you can with a single ball’. These challenge levels provide small ‘snacks’ (as Mark Overmars (professor and creator of Game Maker) once called them in one of his lectures on game design) that allow for a quick play, but are very entertaining for the thrill of beating the highscore. Some examples of ‘snack’ games that are very addictive, partly because of the highscore aspect, are: Jetpack Joyride, Super Hexagon, Super Cratebox and (why was I addicted to this?) Bookworm Deluxe. If the challenge levels in Caromble! provide some of the fun and addictiveness that these games have, I’ll be very happy. As challenge levels are not part of the ‘core’ Caromble! experience, we work on them in our spare spare time (first spare time is reserved for core Caromble! tasks). Last week I had some of this precious time and created 2 challenge level prototypes. For now I call them WallSafety and BallFrenzy. These challenge levels provide a different gaming experience than the core gameplay and hopefully give Caromble! extra appeal. They are fun to create (because it is so simple) and fun to play (because it is so simple). The objective and scoring mechanic are very transparent and perhaps this simplicity makes it so fun. Games have become much more complex over the years and I think that sometimes we long for the simple gameplay of the old days. In that way, games are a nice analogy for life. Most people will interpret this as Homer Simpson’s catchphrase, but that’s actually spelled as “Do’h”. For me, and perhaps most Breakout fans, the story of Arkanoid comes to mind. Arkanoid’s almost unbelievable story goes like this: Vaus is the space vessel that escaped the ill-fated mothership named Arkanoid – hence, the name of the game. That vessel acts as the game’s focal character: the paddle. After some rounds of brick breaking awesomeness the player reaches the final round where the goal is to demolish the ‘dimension-controlling fort’ which is named… “DOH”. This illustrates that a Breakout game can have a story to add to the overall experience. In an earlier post we promised to put in boss fights. We didn’t initially plan this – in fact, we rejected boss fights earlier in the development process because we didn’t see how it would fit into Caromble! – but as art, gameplay and story developed, the boss fights seemed to find its way back onto our agenda and seemed to fit right in. Storywise the paddle is our so-called protagonist, the lead character whom the player can identify with. Opposed to that we have the boss as antagonist, the character that (literally) creates obstacles that the protagonist must overcome. Throughout all aspects of the game the idea of protagonist versus antagonist is a nice contrast to elaborate on. Caromble! is almost gameplay complete now. 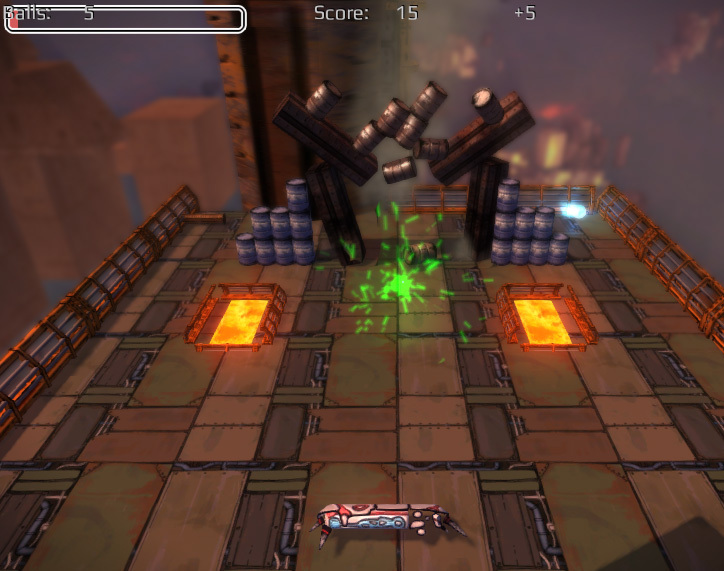 The boss fight is one of the latest gameplay features that we are still experimenting with. Despite the fact that we rejected boss fights earlier in the development process we are really excited that we put this element back into the game. Finally we arrived at the point that we can proudly say “THIS is Caromble!”. P.S. For those wondering what Arkanoid’s “DOH” means. If my Google skills are okay it’s an acronym for ‘Dominator of Hours’. I guess this knowledge will score you some nice points in your next video game themed pub quiz! Are both words that would give you a lot of points if you were allowed to use them in Scrabble. They are also (amongst many others) the building blocks of Caromble!. For most of us, Caromble! has been the first real game we have ever worked on. The Caromble! editor is also the first level editor most of us have ever used. Since we are not using an off-the-shelf game engine, we are also not using an existing editor. We would have to create our own editor as we went along. A screenshot of the editor. The red boxes are actors, which control the game-play The lines indicate the relations between the objects. This system will make the camera switch position as the ball shoots over the ramp. The editor (as we call it) grew (and grows) along with the game. I would say in terms of age the editor is now in its puberty. To be more precise, the editor is in that stage of puberty where body parts lose track of each other and start growing at their own rate. For a piece of software this means that some functionality is mature (like the stuff Raymond wrote about two weeks ago), and some other stuff not so much. It wasn’t until about a year ago that we added some sort of actor system, that allows you to control object interaction from within the Editor. The late addition of such a core system lead to an explosion of all sorts of exotic actors with even more exotic names. Those in the title are firmly among my favorites. To return to my analogy, puberty is a crucial phase of development, although it can be challenging at times. Because we needed the actors, this part grew a lot and right now is a bit out of proportion. As the Editor ages and eventually will reach adulthood, everything will grow back into proportion. Right now we are focused on creating game-play, and the editor doesn’t get all the attention it deserves. We’ll give it that attention before (and if) we release it (after we release the game). Up to this point the background story has been our neglected child. She has become a wild beast. But now we are walking her back from the forest and we begin to tame her. I hear you ask: “Why does Caromble! need a background story?”. The answer is quite simple and binary. Concerning stories there are 10 types of gamers. Those who ignore the story, just play, and find that beating the game is its own reward. And those who want an explanation for what they are doing. But that’s game design theory speaking. The real reason is that we love stories! Every Friday we come up with tons of new game ideas, backing them up with a story as we sing their theme songs describing new fantasy worlds. Games in general are about doing stuff we can’t do in the real world. Caromble! will be about good vs. bad alien ‘viruses’ in an earth-like environment. That leaves us with more than enough ingredients to write a wonderful background story to reward our players looking for meaning in their games and lives.